I own a small blue beaded purse given to me by my grandmother that simply amazes me with the delicacy and beauty of its work. Here is an intricate vintage pattern for a beaded, crocheted bridal purse that must be simply stunning to see in color. I haven’t tried this pattern, but would love to hear from anyone who attempts it and would love to post a modern photo of the finished purse on the site. What a lovely heirloom for any bride! 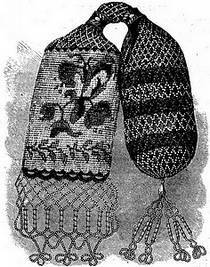 Beaded Bridal Purse, in Crochet is excerpted from The Ladies’ Workbook, circa 1850, which included illustrated patterns for knitting, crochet and point lace projects for the Victorian ladies of the day. MATERIALS..—Six skeins of white crochet silk, two skeins of ombré; scarlet ditto, in long shades, three skeins of slate-colour, and one of bright scarlet. Two ounces of transparent white beads, rather larger than seed beads, four strings of gold, the same size, and a hank of steel to match. For the garnitures (which must be entirely of bright steel), two rings, a handsome tassel for one end, and a deep fringe for the other. Boulton’s tapered indented Crochet Hook, No. 23. Begin by threading all the white beads on the white silk; half the gold on the ombré cerise, and the steel on the slate-coloured. What scarlet silk is used in the square end is without beads; the few rows at the other end, of that colour, are threaded with gold, which may be put on afterwards. The design of the square end consists of a spray of roses and leaves, the former in scarlet ombré with gold beads intermixed, the latter with slate-silk and steel. The ground is composed wholly of white beads, one being dropped on every stitch; where, therefore, the scarlet and slate silks are worked without beads, they appear to be in intaglio. A scroll of steel beads below the group is intermixed with the white, and the top and bottom of the square end are finished off with vandykes of plain scarlet without beads. At the bottom is an open pattern in scarlet, to which is attached the fringe. Begin with the plain scarlet silk, with which make a chain of 100 stitches, and close it into a round. Work one round in scarlet, using in the end of white silk. 2nd round: In which you begin to drop on the white beads. X 2 white, 3 scarlet, X 20 times. 3rd: X 3 white, 1 scarlet, 1 white, X 20 times. 4th: All white; work in the scarlet silk all round, and then fasten it off, as no more is required until the whole square end is worked. 5th: X 22 white, 1 steel, 23 white, 1 steel, 3 white, X twice. 6th: X 21 white, 2 steel, 22 white, 2 steel, 3 white, X twice. 7th: X 3 white, 1 steel, 5 white, 2 steel, 3 white, 2 steel, 4 white, 3 steel, 2 white, 1 steel, 6 white, 2 steel, 4 white, 2 steel, 3 white, 3 steel, 4 white, X twice. 8th: X 3 white, 2 steel, 3 white, 3 steel, * 2 white, 4 steel, *twice; 2 white, 2 steel, 4 white, 3 steel, 3 white, 3 steel, 2 white, 4 steel, 4 white, X twice. 9th: X 2 white, 3 steel, * 2 white, 4 steel, * 3 times; 1 white, 3 steel, 3 white, 4 steel, ** 2 white, 4 steel, ** twice, 4 white, X twice. 10th: X 2 white, 2 steel, * 3 white, 3 steel, * 3 times; 2 white, 2 steel, 4 white, 3 steel, ** 3 white 3 steel, ** twice, 5 white, X twice. 11th: X 1 white, 1 steel, 2 white, 4 steel, 4 white, 3 steel, 3 white, 2 steel, 3 white, 1 steel, 3 white, 4 steel, 4 white, 3 steel, 3 white, 2 steel, 3 white, 1 steel, 3 white, X twice. 12th: x 4 steel, 2 white, 1 steel, 1 white, 5 steel, 3 white, 3 steel, 4 white, 4 steel, 2 white, 1 steel, 1 white, 5 steel, 3 white, 3 steel, 4 white, 1 steel, 3 white, X twice. 13th: X 3 white, 2 steel, 2 white, 1 steel, 4 white, 5 steel, 4 white, 2 steel, 3 white, 2 steel, 2 white, 1 steel, 4 white, 5 steel, 4 white, 2 steel, 4 white, X twice. 14th: 3 white, 2 steel, 2 white, 3 steel, 4 white, 4 steel, 8 white, 2 steel, 2 white, 3 steel, 4 white, 4 steel, 9 white, X twice. 15th: X 4 white, 1 steel, * 3 white, 4 steel, * twice, 8 white, 1 steel, ** 3 white, 4 steel, ** twice, 8 white, X twice. 16th: X 9 white, 4 steel, 4 white, 2 steel, 13 white, 4 steel, 4 white, 2 steel, 8 white, X twice. 18th: x 14 white, 2 slate silk, 34 white, X twice. 19th: X 14 white, 3 slate, 8 white, 5 steel, 20 white, X twice. 20th: X 14 white, 5 slate, 4 white, 9 steel, 12 white, 2 steel, 4 white, X twice. 21st: X 14 white, 11 slate, 1 steel, 3 slate, 2 steel, 10 white, 2 steel, 1 white, 2 steel, 4 white, X twice. 22nd: Begin the ombré; scarlet, X 16 white, 7 slate, 2 steel, 12 white, 2 gold, 2 white, 2 steel, 4 white, 2 steel, 1 white, X twice. 23rd: x 13 white, 11 steel, 12 white, 1 gold, 2 scarlet silk, 1 gold, 7 white, 2 steel, 1 white, X twice. 24th: X 14 white, 9 steel, 3 white, 2 steel, 7 white, 1 gold, 3 scarlet, 6 gold, 5 white, X twice. 25th: X 10 white, 1 gold, 5 white, 7 steel, 2 white, 4 steel, 6 white, 1 gold, 3 scarlet, 1 gold, 5 scarlet, 1 gold, 1 white, 2 steel, 1 white, x twice. 26th: x 7 white, 2 gold, 2 scarlet, 4 gold, 5 white, 2 steel, 3 white, 4 steel, 2 slate silk, 4 white, 1 gold, 2 scarlet, 1 gold, 6 scarlet, 1 gold, 1 white, 2 steel, 1 white, X twice. 27th: x 9 white, 1 gold, 2 scarlet, 1 gold, 2 scarlet, 1 gold, 4 white, 1 steel, 1 slate silk, 3 white, 4 steel, 4 slate, 2 white, 1 gold, 2 scarlet, 1 gold, 3 scarlet, 1 gold, 2 scarlet, 1 gold, 4 white, X twice. 28th: x 11 white, 3 gold, 1 scarlet, 1 gold, 4 white, 1 steel, 1 slate, 3 white, 3 steel, 5 slate, 2 white, 1 gold, 2 scarlet, 1 gold, 3 scarlet, 1 gold, 2 scarlet, 3 gold, 2 white, X twice. 29th: x 8 white, 3 gold, 2 scarlet, 1 gold, 1 scarlet, 1 gold, 4 white, 1 steel, 1 slate, 3 white, 3 steel, 5 slate, 2 white, 1 gold, 1 scarlet, 2 gold, 1 scarlet, 2 gold, 3 scarlet, 1 gold, 2 scarlet, 1 gold, 1 white, X twice. 30th: x 8 white, 1 gold, 1 scarlet, 1 gold, 3 scarlet, 2 gold, 3 white, 2 steel, 1 slate, 3 white, 3 steel, 5 slate, 3 white, 3 gold, 3 scarlet, 1 gold, 4 scarlet, 1 gold, 2 white, x twice. 31st: X 8 white, 1 gold, 1 scarlet, 1 gold, 3 scarlet, 2 gold, 3 white, 1 steel, 2 slate, 4 white, 2 steel, 5 slate, 4 white, 7 gold, 3 scarlet, 1 gold, 2 white, X twice. 32nd: X 8 white, 1 gold, 2 scarlet, 4 gold, 3 white, 1 steel, 2 white, 1 steel, 4 white, 2 steel, 5 slate, 5 white, 4 gold, 5 scarlet, 1 gold, 2 white, X twice. 33rd: X 9 white, 5 gold, 1 white, 3 steel, 3 white, 1 slate, 1 steel, 3 white, 1 steel, 5 slate, 5 white, 1 steel, 2 white, 1 gold, 5 scarlet, 1 gold, 3 white, X twice. 34th: x 20 white, 1 slate, 1 white, 1 steel, 2 white, 2 steel, 5 slate, 4 white, 1 steel, 4 white, 5 gold, 4 white, x twice. 35th: x 19 white, 3 slate, 2 white, 2 steel, 4 slate, 5 white, 1 steel, 14 white, X twice. 36th: X 14 white, 1 slate, 3 white, 3 slate, 1 steel, 3 white, 4 steel, 7 slate, 2 steel, 12 white, X twice. 37th: X 14 white, 7 slate, 1 steel, 3 white, 2 steel, 2 white, 9 slate, 2 steel, 10 white, X twice. 38th: X 14 white, 6 slate, 2 steel, 3 white, 2 steel, 1 slate, 1 steel, 5 white, 5 slate, 2 steel, 9 white, X twice. 39th: X 10 white, 2 steel, 1 white, 2 steel, 4 slate, 2 steel, 4 white, 6 steel, 5 white, 4 slate, 3 steel, 8 white, x twice. 40th: x 10 white, 2 steel, 2 white, 6 steel, 5 white, 1 steel, 3 slate, 2 steel, 5 white, 4 slate, 3 steel, 6 white, 1 steel, X twice. 41st: x 1 steel, 6 white, 2 steel, 16 white, 1 steel, 3 slate, 3 steel, 4 white, 5 slate, 3 steel, 4 white, 1 steel, 1 slate, X twice. 42nd: X 1 steel, 7 white, 1 steel, 1 white, 2 steel, 1 white, 5 gold, 7 white, 1 steel, 4 slate, 2 steel, 5 white, 3 slate, 1 white, 3 steel. 3 white, 2 steel, 1 white, X twice. 43rd: 10 white, 2 steel, 1 white, 1 gold, 4 scarlet, 1 gold, 6 white, 1 steel, 4 slate, 3 steel, 5 white, 2 slate, 2 white, 2 steel, 5 white, 1 steel, X twice. 44th: X 12 white, 3 gold, 3 scarlet, 2 gold, 4 white, 1 steel, 1 white, 4 slate, 3 steel, 5 white, 2 slate, 3 white, 1 steel, 1 white, 2 steel, 2 white, 1 steel, X twice. 45th: X 7 white, 2 steel, 2 white, 1 gold, 3 scarlet, 2 gold, 2 scarlet, 1 gold, 4 white, 1 steel, 1 white, 5 slate, 2 steel, 5 white, 2 slate, 4 white, 1 steel, 2 white, 1 steel, 1 white, 1 steel, X twice. 46th: X 7 white, 2 steel, 1 white, 1 gold, 6 scarlet, 1 gold, 1 scarlet, 1 gold, 3 white, 2 steel, 1 white, 5 slate, 2 steel, 4 white, 2 slate, 3 white, 1 slate, 1 white, 1 steel, 2 white, 1 steel, 1 white, 1 steel, X twice. 47th: X 10 white, 1 gold, 7 scarlet, 2 gold, 3 white, 1 steel, 2 white, 5 slate, 2 steel, 1 slate, 8 white, 2 slate, * 2 slate, 1 white, * twice, X twice. 48th: X 10 white, 1 gold, 3 scarlet, 2 gold, 2 scarlet, 2 gold, 2 white, 1 steel, 3 white, 5 slate, 2 steel, 2 slate, 7 white, 2 slate, 1 white, 3 slate, 2 white, X twice. 49th: X 9 white, 3 gold, 4 scarlet, 6 gold, 4 white, 4 slate, 3 steel, 3 slate, 5 white, 3 slate, 3 white, 1 steel, 2 white, X twice. 50th: X 9 white, 1 gold, 2 scarlet, 1 gold, 4 scarlet, 2 gold, 6 white, 4 slate, 1 white, 4 steel, 3 slate, 3 white, 4 slate, 3 white, 1 steel, 2 white, X twice. 51st: X 9 white, 1 gold, 3 scarlet, 5 gold, 6 white, 4 slate, 1 steel, * 1 white, 2 steel, * twice, 9 slate, 2 white, 1 steel, 3 white, X twice. 52nd: X 10 white, 1 gold, 5 scarlet, 2 gold, 5 white, 4 slate, 1 white, 1 steel, 1 white, 1 steel, 2 white, 3 steel, 7 slate, 3 steel, 4 white, X twice. 53rd: X 11 white, 6 gold, 5 white, 3 steel, 3 white, 1 steel, 5 white, 6 steel, 10 white, X twice. 54th: X 22 white, 1 steel, 2 white, * 1 steel, 1 white, * twice, 1 steel, 5 white, 9 steel, 6 white, X twice. 55th: X 23 white, 4 steel, 2 white, 1 steel, 2 white, 2 steel, 2 white, 7 steel, 7 white, X twice. 56th: X 19 white, 2 steel, 4 white, 1 steel, 4 white, 2 steel, 2 white, 1 steel, 3 white, 4 steel, 8 white, X twice. 57th: X 18 white, 1 steel, 2 white, 4 steel, 25 white, X twice. 59th: (Begin again with the plain scarlet), X 1 scarlet, 4 white, X 20 times. 60th: X 2 scarlet, 2 white, 1 scarlet, X 20 times. 61st: All scarlet; fasten off scarlet. 62nd: With the white silk, 3 chain, dropping a bead on every chain, miss 3, s.c. on both sides of the fourth; repeat all round. Now, instead of working round, work backward and forward, dropping a bead on every chain stitch, so that they may all come on the right side of the purse. 1st row: 5 ch., turn, s.c. in same stitch, X 5 ch., miss 3, s.c. on s.c., X all along the row. 2nd: 6 ch., turn, s.c. on centre of 5 ch., X 5 ch., s.c. on centre of next loop of 5, X to the end. Repeat this row backwards and forwards until 24 are done; then work the same pattern all round for 6 rounds. Thread the rest of the gold beads on the scarlet silk, and do 2 rounds in the same way with it; then 3 rounds of white; then 2 more scarlet, 3 white, then 2 scarlet. To diminish at the end, do 2 rounds of white, like the previous; then 1 with only 4 chain; then 1 with 3 chain; and finally, a round with 2 chain between the s.c. Draw it up with a needle and white silk; sew on the tassel, and slip on the rings. At the other end, do a row to close the round, with the plain scarlet in s.c.; on which work X 6 ch., miss 4, s.c. under 5th, X 10 times. Turn, and in each loop work 2 s.c., 4 d.c., 2 s.c.
Fasten off, and sew on the deep fringe garniture.